Lini in a field of Arnica at Anjali Farm in South Londonderry. Lini in her greenhouse with amaranth. Ancient healing techniques are becoming more commonplace in our country as people recognize the benefits of a multidisciplinary approach to health. One of these is Ayurveda, which is considered by many scholars to be the oldest healing science. Ayurveda, which means “The Science of Life” in Sanskrit, originated in India more than 5,000 years ago, and was handed down through oral tradition and eventually print as of a few thousand years ago. Ayurveda considers balance an important principle and encourages health to be maintained by giving attention to diet, lifestyle, the use of herbs, and other practices that help to balance mind, body and soul. At conception, our own pattern of energy is set, and this determines our constitution — our individual combination of physical, mental and emotional characteristics. Ayurvedic science identifies three basic types of energy that are in each of us, which they call doshas. These three doshas — Vata, pitta and kapha — need to be in harmony, and if out of balance, can create dysfunction in our bodies and minds. An Ayurvedic practitioner can help you to identify which dosha is primary in your constitution, as well as which doshas are out of balance. Through diet, herbs and daily practices, one can help to balance and align their energy. 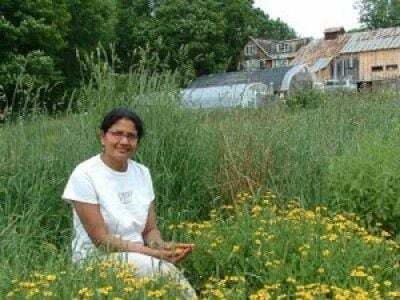 A local expert in Ayurveda is Lini Mazumdar of Lotus Moon and Anjali Farm in South Londonderry, Vermont. She is a certified herbalist, and an Ayurvedic nutritional counselor and chef. I asked Lini some questions to learn more about the services and goods she offers. I make a line of herbal body products, called Lotus Moon Medicinals. I also have an Indian food and catering business and teach Ayurvedic classes locally. How did you become interested in Ayurveda? I was drawn to Ayurvedic nutritional practices once we started farming and growing food on Anjali Farm. We started farming here in 2000, and grew mixed organic vegetables, berries and eggs. What are the health benefits of Ayurvedic practices? Ayurveda is a 5,000-year-old health science with origins in India. Its practices align us with our own true nature and the environment around us, to help keep us in balance and perfect health. How do you work with clients as an Ayurvedic Nutrition Counselor and Herbalist? When someone makes an appointment, I send them an intake form which they fill out and return to me before their appointment. This helps us both focus on what we’ll be working with. I then meet with them in person for about 2 hours to figure out their “dosha” (constitution), ask them questions based on the intake form and then write up my recommendations based on the four pillars of health: aahara (diet), asana (exercise), nidra (rest) and pranayama (breathwork). I will also take into consideration the season and what their ailments are. If someone wants more specific help with cooking and meal prep ideas, I also can go to clients’ homes and work in their kitchens with them. To learn more, contact Lini at linimazumdar@yahoo.com or visit http://www.anjalifarm.com.